I have been meaning to write up this tip for awhile now and finally decided to just keep it short and sweet. There are many ways to learn about using, extending and installing Microsoft Dynamics CRM. But sometimes you just want an answer and you want it quick. Maybe you have already scanned Community Top 10 Microsoft Dynamics CRM sites (aka CRM 101). Here is one of the fastest ways to find an answer. Use the Microsoft Dynamics Forums to get your answers. Ask in the Correct Forum. 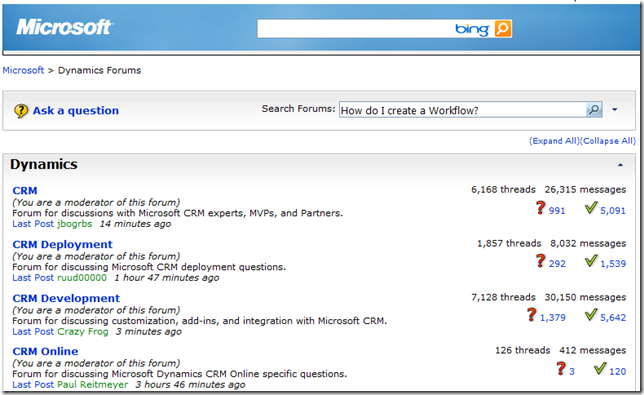 For example if the question is specifically about CRM deployment, ask in the CRM Deployment not the CRM Dev forum. Give us enough information to help you. For example if you are using a legacy program like CRM 2.0 or such, we would need to know that before we try to answer the question.